President Obama, like other world leaders, said a lot of things as a candidate but once in office has done nothing but carry out the dictates of corporations while the rise of Greenhouse Gas Emissions continues globally. And now Obama is pushing the TPP, a huge trade agreement that will only prevent efforts to keep the global temperature from certain disaster for all life on earth. It also appears that our leader is about to approve of the Keystone XL Pipeline (so far), which would bring dirty oil from Canada for processing in the United States. 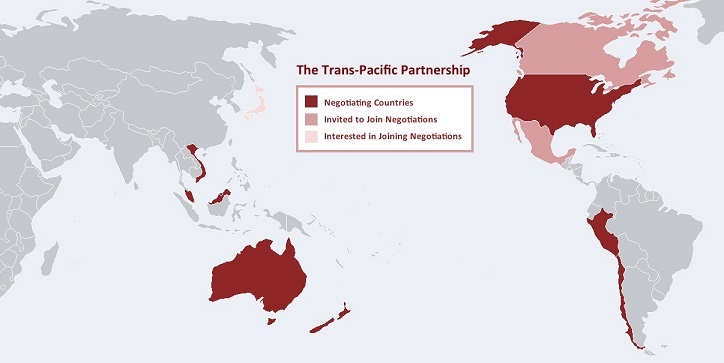 Click on image of TPP map for larger view. A change in the U.S. recently by power plants changing from coal to natural gas did cut down on CO2 emissions in the United States. However, American coal companies are simply selling their coal to China, India, European countries and anyone else who wants cheap dirty fuel. The result: Greenhouse gases are continuing to rise globally. There is no boundary to the spread of CO2 levels. And the oil from Canadian tar sands will contribute to the increase of CO2 levels, leading to serious problems for the future if current efforts aren’t taken now. 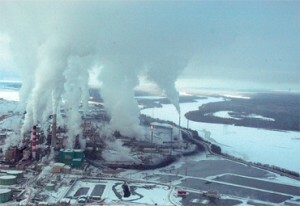 In the photo the water, ground and atmosphere are being contaminated with several toxic substances. The President of the U. S. Chamber of Commerce, Tom Donohue, has approved all trade agreements because there were no provisions in the agreements that would guarantee any changes favorable to workers or the environment. Obama is currently pursuing this larger economic agreement that will also fail to protect workers or the environment. It will, though, continue to be business as usual. Another given will be the dismantling of our nation and its sovereignty. 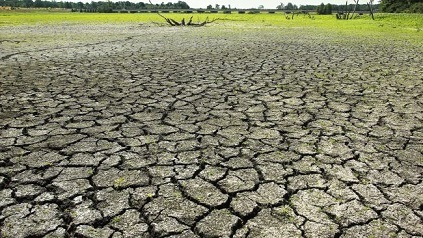 Literally, it means that if a huge part of the Great Plains enters into a drought that persists for several years and temperatures increase by 10 to 15 degrees F, our government will try to find something that will grow with little or no water and scorching deserts. A large number of immigrants from Mexico will wind up in this area, which cannot support the present population. Let’s see. 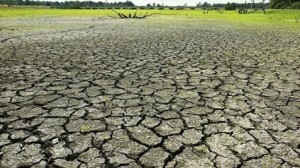 Too many people and not enough water for people or farm crops. Unfortunately, the CEOS haven’t gotten around to their part of the deal. And you should know, this ruling corporatocracy has no intention of stopping or slowing down the growth of global greenhouse gases. With 2 billion more people by 2050, the CEOs can only think of trillions of paper wealth added to their coffers. And a billion more vehicles. The Inevitable 2014 Headline: Global CO2 Level Reaches 400 PPM For First Time In Human Existence. “Sometime, about one year from now, the front pages of whatever decent newspapers are left will carry a headline like the one above, announcing for the first time in human existence (or in nearly a million years, or three million years, or 15 million years), the global atmospheric concentration of carbon dioxide-the principal gas causing climate change-will have passed 400 parts per million (ppm).” Read more.